Pretty and Polished is known for bold glitters (and more -- but this is how the brand started out ya know), and the Whatta Mighty Good Mani collection is no exception! This group of six polishes is not only super fun but also have amazing names inspired by hip hop and R&B songs. Seriously, these names are awesome. They are nail related AND music related, and I really appreciate wordplay. Who doesn't? Blurred Visible Nail Lines is pinkish red coral shade with a medium holographic effect. Inspired by Robin Thicke's "Blurred Lines," this shade needed three coats for the opacity shown here. It's a great fall shade without being too muted and I know some of you subscribe to the "buy ALL the holos!" mindset! I Don't Think You're Ready For This Crelly is a royal blue crelly (this is the only time I will use this word haha) with blue, purple, and silver glitters. The name is inspired by Destiny's Child's "Bootylicious," and I used just two coats for the swatch below. I am always impressed when jelly polishes still show the glitter but don't need a billion coats. You may need a few coats of topcoat to smooth everything out. Nails Up and Touch the Sky is an adorable candy pink base accented by pink, purple, and white glitters, plus purple shreds. This shade is inspired by Nicki Minaj's "Starships." I used three coats for the swatch below. This is F$@#ing Awesome is a supa rad glitter topper that has pink, green, and blue squares as well as black diamonds, hexes, and shreds in a clear base. I am loving the black diamonds in this, in particular. Layer it over white for an 80's effect (in the best of ways)! Inspired by Macklemore's "Thrift Shop," I've shown it here over Sally Hansen Barracuda. You Down With PnP, Ya You Know Me! is inspired by the song "O.P.P." by Naughty by Nature. This grey based semi-opaque jelly has blue and green hex glitters, and I used three coats for the swatch below. This one will need a few coats of topcoat for smoothness. I am always appreciative of a good clever polish name, and all of these are killer. They are fun and youthful, and I love all of the bright colors! The formulas are all easy to work with: no glitter clumping, none of them needed more than four coats, and I didn't have any problems with streaking. 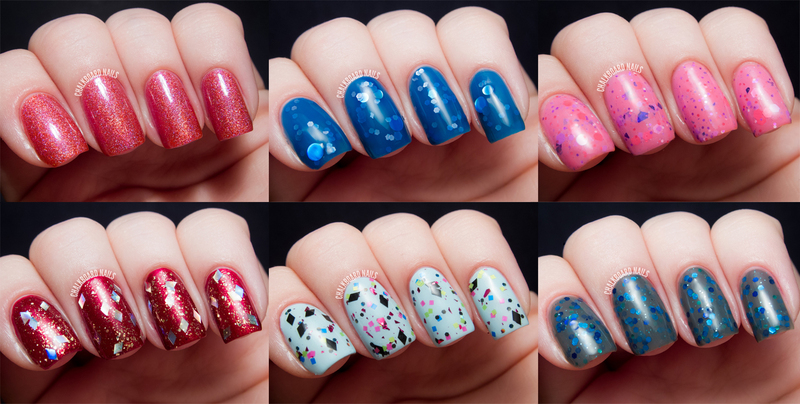 You can shop this collection via shopprettyandpolished.com; each polish retails for $8.50. You can also keep up with the brand on Facebook, Twitter, & Instagram. Which one of these songs will you be rocking on your nails? i feel like i don;t think you're ready for this crelly is a def must have! Nails Up and Touch The Sky is super cute!! I would love to find a blue jelly polish like the crelly up above but without the glitter in it. 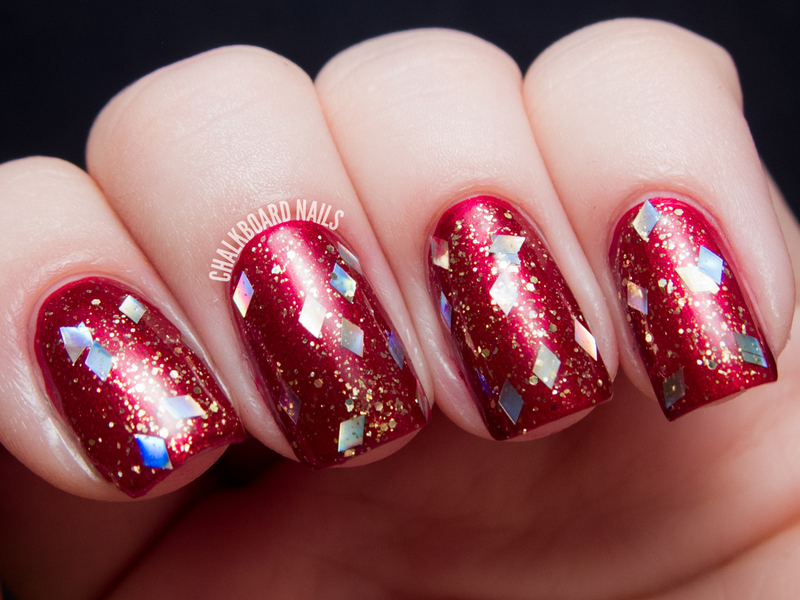 And that holo is just gorgeous! I wasn't aware they had described the song as 'fun' and actively supported it - that makes me more uneasy. The lyrics of the song are just terrible and sustain the frankly sexist presentation of women in the music industry. Not something to be described as 'fun'. However, even if I wouldn't buy this particular polish, I still would probably not boycott Pretty and Polished. This is an issue across pop culture, not just them. How many companies, TV networks, music labels and radio stations would I be boycotting if I took that attitude? In my humble opinion, the way to tackle these ideas is to support products that champion female equality and take this attitude into our day to day lives, not get up in arms about nail polish names! Love the blue one...these are beautiful.